EXL165-5 is the 5-string version of the most popular D’Addario hybrid bass set which combines the high strings from an EXL170 (.45 and .60) with the low strings from an EXL160 (.85 and .105). With the addition of the .135 Low B string, this set is optimal for players looking for the ideal combination of comfortable playing tension, clear fundamentals and booming, tight lows. Fits basses with a string scale length of up to 36 1/4 inches. 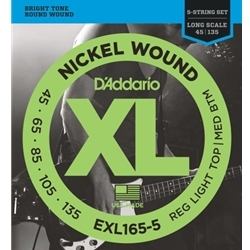 D'Addario XL Nickel Wound Electric Bass strings are world-renowned as "The Player's Choice" amongst bass players of all genres and styles. All XL strings are precision wound on our exclusive digitally-controlled machines, ensuring each string has excellent intonation, clear fundamentals, and unparalleled consistency. Each string is wound with a nickelplated steel wrap wire known for distinctive bright tone with excellent magnetic output delivering a universally appealing and versatile tone for all playing styles. Features: 5-string version of our popular hybrid EXL165 which combines EXL170 and EXL160 for ideal combination of distinctive bright and powerful low end Round wound with nickelplated steel for a distinctive bright tone with clear fundamentals Fits long scale basses with a string scale length of up to 36 1/4 inches Made in the U.S.A. for the highest quality and performance Environmentally friendly, corrosion resistant packaging for strings that are always fresh.